Comrade Bala Bobboi Kaigama and Comrade Joe Ajaero, the Organised Labour said the Minister was being economical with the truth, pointing out that the committee arrived at a figure which is to be presented to the President. Labour said the subcommittee on figure chaired by the Minister presented four different figures which the committee deliberated on for several hours before agreeing on a figure. 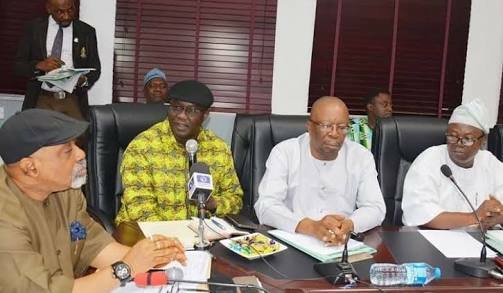 The statement said; “Our attention has been drawn to a statement credited to the Honourable Minister of Labour and Employment, Senator Chris Ngige claiming that no amount has been agreed by the Tripartite Committee recommendation to government. The report further claimed that the Minister said that government was still negotiating with Labour. “It is rather unfortunate and sad if indeed, the Honourable Minister made those statements. For the avoidance of doubt, organised labour representatives wish to state unequivocally that the Tripartite Committee concluded is work, adopted a figure through a formal motion moved, seconded and adopted in the absence of any counter motion. “The subcommittee worked on the basis of a figure proposed by the Federal Government, figures proposed by a number of state governments: as well as proposals submitted by the Organised Private Sector and Organised Labour. “The Committee formally adjourned its sitting with a decision that a date will be communicated to members for the signing of the report and submission of same to Mr. President.